Adjustable height desks or sit stand desks as they are sometimes called, allow your employees to work in a position of greater comfort and individual preference, without sacrificing productivity. Sit stand desks ensure that you maintain a good posture in your work space, and are a welcome change from hours of sitting in one position at a desk. With a flexible height office desk that offers the user the ability to sit or stand, you can accommodate the latest thinking on employee health which has the potential to prevent work related injury, fatigue, improve wellness and attendance, and establish your office as a progressive workspace where employee needs and preferences are important. Products like adjustable height or sit stand desks, kneeling chairs, etc. help integrate movement into a monotomous office routine that requires sitting for long periods of time. These ergonomic desks ensure that you can be constantly on the move – without leaving the office. BE Furniture is one of the worlds leading experts on integrating ergonomic furniture with modern office design as well as the special needs of the handicapped or disabled workers. We can help you choose pieces that complement and enhance your chosen office design motif for a truly beautiful and forward looking workspace. BE represents dozens of manufacturers of ergonomic furniture like so called “sit-stand desks”, kneeling chairs, and much more. If you are specifically interested in pieces like sit-stand or adjustable height desks, here are some things to consider. Productivity boost: With the ability to move around and tailor your work environment to your bodys needs, you are able to get the job done comfortably – and efficiently. Office Design Flexibility: With the ability to custom change your desk position and height, you have the luxury of giving your office unique and different looks without the cost and hassle of moving furniture around. 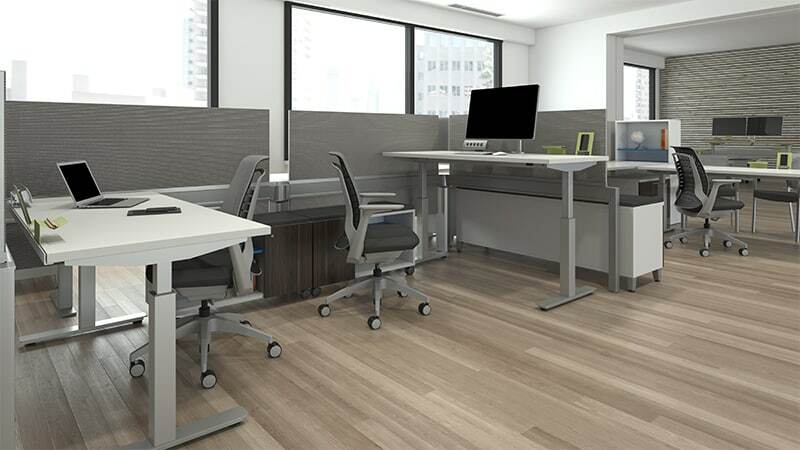 Collaborative office environment: flexible office desks allow you to tailor your interactions with whoever may be in your office – sit to stand in mere seconds without having to rearrange anything except the height of your desk! While you probably won’t want to be standing the entire time that you are working at your desk, with flexible, adjustable height ergonomic desks, you will now have the opportunity to do so for short stretches. BE Furniture is a national distributor who represents dozens of manufacturers of adjustable height desks and other ergonomic furniture. We can procure exactly the right piece for your situation by helping you with expert advice and competitive pricing. We can send pieces to your location or assist you completely in your ergonomic office fit-out. At BE we aim to go BEyond the furniture. Call us today and see how comfortable an office furniture partner can be.